Spread team colors and spirit with official Dallas Mavericks license plates that are sure to be a big hit amongst fellow fans. 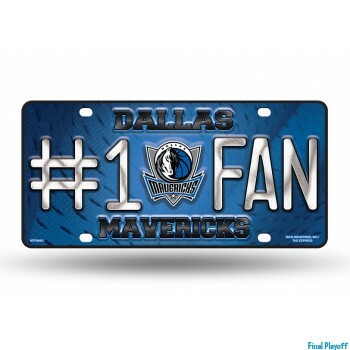 Shopping for the right metal Dallas Mavericks license plate is easy with embossed designs to choose from. Plastic diecut Dallas Mavericks license plates are popular with pre-drilled holes for easy mounting on walls or doors being light weight. Our direct online prices will be your one stop shop source for your favorite license plates. We here at Final Playoff know that shopping online can be a little frustrating and assure you that we are a trusted online retailer who take your online security serious and never share our customer account information with anyone. Whether on or off season, all the products listed on our site are handled with a priority to make sure you receive your items for important events and celebrations such as tailgates, holidays and special gifts. We handle special orders shipped to loved ones no matter how big or small the order is. All our fan gear merchandise are official products by the leagues and manufactured by industry pros such as Wincraft, PSG, Fremont Die, Hunter, Mcarthur sports, rico, Team Promark and Forever Collectables. All Dallas Mavericks orders are processed and marked for shipping same business day Monday through Friday 9:00am to 6:00pm pacific time excluding holidays and weekends. Rest assured knowing that your sports team merchandise is packed and shipped in house for an error free delivery. Check out other fabulous items in our catalog and bookmark our site for a future return on updated new arrivals.